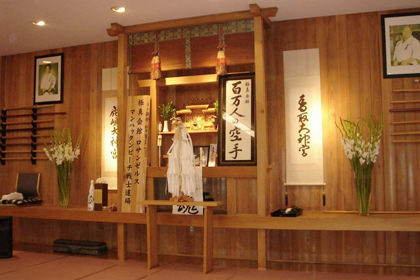 The Manhattan Beach branch is one of the few traditional Japanese dojos in North America. The dojo is one of the largest martial arts schools with a 5,000 square foot practice area, including authentic martial arts specific wood flooring. The Manhattan Beach facility has a weight room and heavy bags for training, and full locker rooms for both men and women. The facility was built in 2001 and the students take care of it with pride. 1987 “POWER KARATE” was established in Los Angeles and Patrick Fard was the youngest dojo operator of Oyama Sosai at IKO Kyokushinkaikan in Los Angeles. Patrick Fard was determined to succeed and honor his long life goals. Shihan Patrick Fard was born in July 1968, and began his training in the art of Kyokushin Karate at the age of seven. Passionate to learn from the start, he trained religiously and achieved his black belt by the age of fourteen. He began competing in tournaments at just eight years old and throughout his life has traveled all over the globe to achieve and experience at different championships. After 40 years of experience Shihan Fard is one of the highest ranking member in North America with 5th degree black belt. He is now the first and only black belt in the history of Kyokushin in North America by completing 50 man Kumite at IKO Kyokushinkaikan World Headquarters in Tokyo Japan and 3rd in the world at the age of 44. Los Angeles Kyokushinkaikan at Manhattan Beach is one of the only traditional Japanese dojos in North America. The dojo is one of the largest martial arts schools with a 5000 square footage including authentic martial arts specific wood flooring. The facility has a dormitory living space, weight room with full cross fit training equipments, heavy bags, and full locker rooms for both men and women. This facility was built in 2001 and the students take care of it with pride for generations to come. As US Branch Chief and IKO Public Relations Director, Shihan Fard continues to actively participate in the IKO Kyokushinkaikan as an event director and official, every year directing, organizing and judging major events all over the world, including the USWC Karate Championships in LA, All American Karate Championships in NYC, and after 40 years of establishment of Kyokushinkaikan in Iran organized the 2015 Asia and Middle East Open Karate Championships. 2016, 15, 14 13, 12 & 11 “AIBBC” Black Belt Conference and The 2012 “IIEC” Iran International Elite Championships that marks the history. He also enjoys teaching and coaching a new generation of Kyokushin champions, as his own students currently competed in many of the major events in North America. In 2001 and 2002, he established, organized and hosted the first Karate Championships in Los Angeles with total of over 7000 spectators. He is currently preparing to host and organize the annual IKO LA Seminar on September 2016 and the 2st LA Cup International Kata Championships, as well as for 2017 to celebrating the 30th anniversary of POWER KARATE & IKO Kyokushinkaikan Los Angeles with Kancho Matsui, Shihan Katsuhito Gorai and most senior North American branch chiefs at biggest events of the year in the world of Kyokushinkaikan affaires. In addition Shihan Fard at IKO Kyokushinkaikan devoted his life to teaching the art and philosophies of KARATE through the only full-time Kyokushin Dojo in California. With Power Karate USA just passing it’s 29th Anniversary, Shihan Fard continues to dedicate his life to sharing the lifelong benefits of Kyokushin with students of all ages and levels from pre-school to black belt. All of his current black belts began their training with Shihan Fard, some as children, and have followed his guidance and inspiration to reach and challenge themselves in ways they never Imagined possible. Shihan Fard’s teaching philosophy centers on developing the ‘mind, body, spirit’ connection in each student. His methods emphasize self-control and discipline, concentration and inner strength that will serve to guide and inspire his students to train their bodies and minds beyond the requirements of a typical ‘sport.’ Ultimately, they’ll not only learn the art of Kyokushin Karate, but more importantly they’ll gain self-confidence, respect and a deeper knowledge of themselves. In short, Shihan Fard’s students develop a strong, positive spirit that will resonate not just in the dojo, but in every aspect of their daily lives. This is the spirit of “OSU!” … the essence of Kyokushin Karate. Our mission is to strive for excellence while providing quality instruction to each and every karate-ka who entrusts his or her body, mind and spirit to our dojo (training hall). We are committed to the education of all of our karate-kas as well as providing for the dojo’s needs in the most empathetic and professional environment possible. Our intent is that the benefits of our commitment to the excellence will positively impact the lives of our instructors, our karate-kas and the community we serve. Because an exceptional organization cannot be built upon an inferior foundation, we are committed to the highest quality in all aspects of the operation of the dojo. This includes qualified instruction, state of the art equipment and a traditional Japanese facility. Average will not be tolerated by any member of our dojo. Our instructors are individuals of superior moral character, having the highest standards of ethics and integrity. Our team commitment to excellence extends to all aspects of our personal and professional lives, including neatness, attire and punctuality. Because personal initiative is the hallmark of the members of our team, each member subscribes to the belief that his responsibility is never limited to the specifics of his job assignment. The by-product of our dedication to motivate and work with each other is an infectious enthusiasm exemplified by teamwork. The foundation of our ability to provide an exceptional organization with quality services and a structured environment is the key to the organization’s financial stability. We must maintain productivity and profitability by charging fair fees commensurate with the quality services we provide. A return on Power Karate financial investment (practice purchase) and time (teaching and training with each individual) is both deserved and expected. All instructors serve on a volunteer basis, viewing their service as part of the process of developing body, mind and spirit in the Kyokushin way. Promotions in belt rank will be determined by IKO Kyokushinkaikan and will be based on each student’s level of commitment and performance. The Shihan will keep instructors abreast of all changing trends in the art of Kyokushin Karate and make any necessary corrections in training, techniques and systems. The Shihan will use his best efforts to provide a pleasant environment in which instructors will be able to work most constructively. Instructors will always be informed as to what is expected of them; however, their performance will be monitored to ensure it meets expectations. We realize that karate-ka satisfaction is not the result of a haphazard sequence of events, but rather is achieved through the planning, hard work and perseverance to which our dojo instructors are dedicated. Although every karate-ka is a unique human being with his or her own needs, wants and desires, we, the instructors, accept the challenge of sensing, serving and satisfying those needs thus enabling our students to reach their fullest potential. Because the needs of those we serve are ever-changing, our team is committed to the development of new skills and the constant refinement of existing systems. Continuing education and instructor training serves not only to motivate our team to reach new heights with regard to managerial and instructional expertise, but also to ensure that our karate-ka always receive state of the art martial arts training. Karate-do, the art of empty-hand fighting, has spread rapidly since the early 1960’s to become a valued pursuit in most societies around the world today. What was once shrouded in a veil of oriental mystery is now recognized as what it is — an art of life which teaches its practitioners to efficiently defend themselves and others in time of personal threat. Kyokushin, pronounced “key-yoku/shin”, means “the ultimate truth”, and is reputed throughout the martial arts world as The Strongest Karate. It was invented in 1953 by the late Grand Master Mas Oyama. After studying the Martial Arts for two decades, training in many different forms, from Korean and Chinese, to Japanese styles, as well as boxing and self defense tactics in North America, he created Kyokushin from what he believed to be the best qualities from each. He then combined his own practical training methods so the application of these ancient forms would suit 21st century practitioners. This is the fundamental reason Kyokushin Karate differs from other forms. It remains very traditional in its teaching methods, protocols and beliefs, yet surpasses rigid guidelines to allow its practitioners to individually grow and progress. Dedication to the art has given many masters what may be regarded as a mysterious aura, an emanation of power and confidence. This aura is nothing more than a reflection of what anyone can achieve with concentration and effort. The true karate-ka is calm, courageous, alert, humble, happy and healthy. The art takes one beyond the instincts of fighting to a completely fulfilling way of life. It offers an opportunity to that person who is willing to seek something beyond the average day-to-day existence. Life takes on meaning and purpose, directed by one’s own conviction that it is far more courageous to act and think from the platform of righteousness and thoughtfulness than from selfishness and mediocrity. Karate-do, the art of empty-hand was originally developed on the island of Okinawa from the 17th century and brought to Japan in the early 20th Century. Post World War II, karate spread rapidly to become a valued pursuit in most societies around the world today. Kyokushin karate, pronounced “key-yoku/shin,” means “the ultimate truth,” and is reputed throughout the martial arts world as “The Strongest Karate” for the reputation of its top fighters and their rigorous and thorough training methods. It was founded in 1953 by the late Grand Master Mas Oyama. After studying multiple martial arts for 2 decades, he created Kyokushin from what he believed to be the essential elements from each. He then combined his own practical training methods so the application of these ancient forms would suit 21st century practitioners. This is the fundamental reason Kyokushin Karate differs from other forms. It remains very traditional in its teaching methods, protocols and beliefs, yet surpasses rigid guidelines to allow its practitioners to individually grow and progress. To study Kyokushin Karate is much more than learning a series of punches, blocks and kicks that could ultimately serve to defend its student in a time of threat. To study Kyokushin Karate is to train ones body, mind and spirit to work as one efficient machine in a way never imagined. Power Karate of Manhattan Beach is the only full-time Kyokushin school in the Los Angeles area. Providing a 2,000 sq. ft training area, Power Karate is a traditional Japanese dojo and the training provided is authentic adhering to the strict guidelines directed by the International Karate Organization (IKO) followed all over the world by over 12 million practitioners. Every student who trains at Power Karate will learn the same techniques and follow the same traditions and protocols whether they’re four years old or forty. Even more important, Power Karate is a family. A family of children and adults who come together to encourage each other, learn and grow to understand themselves a little better each time they train. If you’re thinking of enrolling a child in karate, you’ve no doubt heard or read many things about the potential benefits of continued karate training. Confidence, self-discipline, self control, focus, respect and inner strength are among the most common attributes associated with children (and adults) who have committed themselves to long-term karate training. Why does karate provide these benefits while another ‘sport’ might not? Because karate is not a sport. Karate is a process that will ultimately train the body, but more importantly the mind and the spirit in a way that a traditional sport cannot. First and foremost, for a child, karate is fun. The dojo is a place where a child can learn, expend boundless energy and yell (called, “kiai”) with all their hearts. However, as they’re learning and moving, they’ll be directed and encouraged to focus and concentrate their energy into executing the techniques properly and at the appropriate times. They’ll be asked to challenge themselves to try their hardest and give more effort than they believe they can. Eventually, they’ll find that their efforts pay off, as they’re able to perfect their techniques and execute more difficult techniques, thus building their self-confidence. It’s visible on their faces as they leave the dojo after class – they feel happy and confident in their accomplishments and they’ve had fun. Because the practice of karate is ultimately a journey of self-discovery, it becomes more than just an hour of exercise. For many children, it becomes a part of their lives and a core strength that they are able to draw on in all aspects of their daily life – at home with their families, at school and with their friends.